Considering his measured pace and grimy-over-graceful style in the ring, future Hall of Fame boxer Bernard Hopkins has a habit of turning the media hype and publicity stunts leading up to his fights into a more entertaining spectacle than the fight itself. The promo period is underway for Hopkins’ next bout, against Beibut Shumenov on April 19 in Washington, D.C., to unify their IBF and WBA light-heavyweight titles. Hopkins was his typical charismatic self at the event, seamlessly putting himself in the same sentences with Barack Obama and Muhammad Ali, engaging the crowd to the point where it seemed even his opponent was just there as a spectator. But Hopkins doesn’t even have to change gimmicks (going from “The Executioner” to “The Alien” in recent years) or taunt his opponents with culturally-insensitive tactics (remember him dropping bags of rice and beans in front of Felix Trinidad?) to draw attention to his fights anymore. Because by merely stepping into the ring, Hopkins is making history. 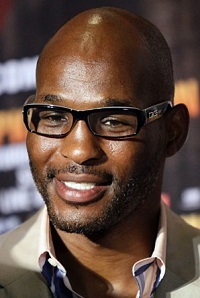 At 49 years old, Hopkins already holds the record for being the oldest boxer to win a world championship. If he beats 30-year-old Shumenov, he’ll become the oldest to unify major titles. Hopkins said he plans to fight at least until he’s 50 years old. Hopkins, a Muslim from Philadelphia, takes his 54-6-2 (32 KOs) record into the ring with Shumenov, a Muslim from Kazakhstan who is significantly less experienced at 14-1 (9 KOs) but has power and speed on his side.